Champaign, Illinois is throwing around the idea of placing a tax on disposable plastic and paper bags. The goal is simple: to reduce the community’s carbon footprint. The secondary benefit of such a tax would be the revenue. The bag tax could raise nearly $200,000 in revenue for Champaign, according to Angela Adams, recycling coordinator for the City of Champaign. The money would go back to the community and would be used to finance programs and resources for the City, including an education campaign on recycling. Imposing additional taxes is a tough sell at any time, but the current economic climate does not make this difficult task any easier; however, many of the residents of Champaign, the same people who would be responsible for paying the tax are in favor of it. Bear in mind, these are the same people who would benefit from the tax. In a recent poll 67 percent of the citizens of Champaign favored a tax. Despite this support the road to imposing the tax has not been quick or smooth. Efforts have been renewed and city leaders are moving forward in hopes of making the tax a reality as early as this summer. A city survey about bag litter incited a 2-and a half hour discussion at a recent city council study session. The majority of the comments made at the meeting were in support of using reusable grocery bags instead of disposable bags. 900 of the respondents indicated that they reuse disposable bags, but at the same time these respondents also indicated they are concerned about the impact of disposable bags, particularly plastic bags, on the environment in terms of litter. This discussion was followed by a 6 to 3 vote in favor of the fee. Aside from support on the city council front, the tax has also found support from the 10 members of the University of Illinois’ Students for Environmental Concerns. These members also attended the city council study session and displayed pictures of bags littering Boneyard Creek and farm fields in the area to show the impact of disposable plastic bags on the environment. The tax is aimed to discourage residents from using plastic bags and instead carrying goods home from the supermarket and other retail stores in reusable shopping bags. By implementing this tax shoppers in Champaign will face a choice when they do their shopping, they can pay the tax or bring their own bags. “I’m not looking for a new tax to generate revenue to fill our budget gap,” said council member Deb Frank Feinen. “I’m looking for a disincentive for people to choose plastic or paper bags at the grocery store.” The main problem with plastic bags is the litter issue. Champaign is not the first City plagued by plastic bag litter and they will not be the last. Carelessly tossed plastic bags or bags picked up by wind are eyesores and wreck environmental havoc. They are a risk to unassuming animals who may mistake them for food or become entangled in them, and they also hold rain and dew, creating ideal breading grounds for mosquitos. These insects at their best are a nuisance, but at their worse carry deadly diseases. There are concerns that imposing the tax will discourage people from shopping in Champaign. 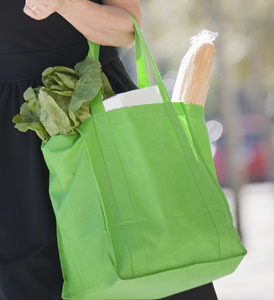 In can be tempting to hit up a nearby store outside the city limits and not have to deal with the tax versus shopping in Champaign and opting to either pay a fee per each disposable bag used or remembering to bring reusable bags. Karen Foster, one of the council members who voted against the fee, has stated that the city should not legislate over a business’ right to carry disposable bags. Foster says the city is ‘nickle and diming’ residents and people cannot afford another tax. These are valid points, paying the tax for each bag you use every time you head to the store can add up to a substantial amount of money in no time. Although at anywhere from 99-cents to $3.99 reusable shopping bags require a cost upfront, but are cheaper than paying the tax over time. Champaign, much like other municipalities that have taxes or bans in place, have discussed options for low income residents, such as providing reusable bags at no cost or waiving the tax. However it works out this movement is driven by the community for the community. Many of the residents share the common goal of cleaning up the environment and making their home a cleaner, nicer place to live. These shared objectives will make it easier for the council and the tax payers to reach a mutually agreeable arrangement and encourage reusable grocery bags. To learn more about Champaign’s efforts go to http://www.dailyillini.com/index.php/article/2012/03/plastic_bag_ban_would_benefit_champaign.